Item #DR-16853: 14Kt. 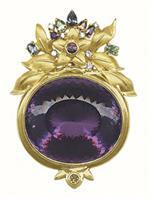 Yellow Gold Brooch/Pendant/Enhancer with bezel set 26x31mm portuguese cut oval Amethyst of 100.89 cts., seven prong set round Diamonds of .17 cts. TW and nine prong set round Gemstones of 2.04 cts. TW. Item #DR-9596: 14Kt. Yellow Gold Brooch with bezel set 6x8mm octagon Amethyst of 1.91 cts. and two each bezel set 5x7mm pear shape Blue & Champagne Topaz of 3.10 cts. TW. Item #SC-BRFA-0043-X1: 14Kt. Yellow Gold heart shaped Brooch with eighteen bead set 3mm round Amethysts of 1.84 cts. TW. Item #SC-BRRW-34-B1: 14Kt. Yellow Gold Flower Brooch with 12x22mm fancy fluted Black Onyx Vase,sixteen round Diamonds of .23 cts. TW bead set in White Gold and prong set 3x5mm oval Gemstones (five Blue Topaz of 1.51 cts. TW, five Peridots of 1.19 cts. TW. Item #P1767: 14Kt. White Gold brooch with four 3.5mm round Blue Sapphires of 1.00 Ct. TW and round Diamonds of 1.00 Ct. TW. Item #SC-BRSA-54: 14Kt. 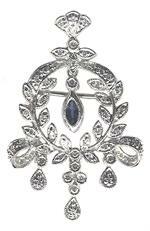 White Gold Brooch/Pendant with one bezel set 2.5x5mm marquise Blue Sapphire of .16 cts. and fifty-two bead set round Diamonds of .30 cts. TW. Item #GSJ-2135/FS-7088: 18Kt. Yellow Gold Pendant Enhancer/Brooch with one prong set 7.3mm round Kanchanaburi Blue Sapphire of 1.76 cts. and one hundred seven bead set round Diamonds of 1.30 cts. TW. Item #BK-9924994: 14Kt. Yellow Gold Brooch with two prong set trillion Blue Sapphires of 1.10 Cts. T.W. Item #SC-BRSA-004: 14Kt. 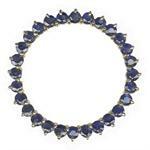 Yellow Gold Circle Brooch with twenty-eight prong set round Blue Sapphires of 2.03 cts. T.W. Item #SC-BRFB-0043-X1: 14Kt. Yellow Gold Heart Brooch with eighteen 3mm round Blue Topaz of 2.48 cts. TW. Item #GSJ-2350: 18Kt. Yellow Gold mask brooch with 3x29mm rectangular Colorless Danburite of 1.82 Cts. and fifty-six round Diamonds of 1.03 Cts. TW. Item #TM-CO760: 14Kt. Yellow Gold Circle Brooch with eight each 4.5mm round Cultured Pearls and 3mm round Amethyst. Item #SC-BREM-04: 14Kt. Yellow Gold Circle Brooch with twenty-eight prong set round Emeralds of 1.73 cts. T.W. Item #VCT-BR-1250: ESTATE PIECE - Victorian Era 14Kt. Yellow Gold brooch with carved floral & leaf design Green Jadeite and sixty-three seed Pearls. Item #SC-BRFC-43-X1: 14Kt. Yellow Gold heart brooch with eighteen 3mm round Golden Citrines of 1.80 Cts. TW. Item #GSJ-2640: 18Kt. Yellow Gold brooch with 7x14mm marquise African Lime Green Tourmaline of 2.96 Cts. and two 3mm round Diamonds of .20 Cts. TW.